Owing to the challenging weather this week’s run will hopefully be sheltered from the elements, but still be interesting. The Gwydyr Forest will be the playground for this weekend’s Sunday Morning trot. Meet at 10.30am at the Marin Trail Carpark just up the hill from Gwydir Castle, Llanrwst (GR790609). A hilly route of just over 8 miles, but this can easily be extended with no hassle, or cut short without getting lost for those not after something so long. Cafe in Llanrwst for tea and cake afterwards. After a fine showing at Lilleshall (great efforts from Richard Roberts, Nathan Jones, Craig Jones, Matthew Fortes, Arwel Lewis, Adrian Williams, Paul Jenkinson, Kean Rowlands, S L Jones, Stuart Mcdonald, David Kirkby), the Eryri men have managed to move back up to 4th in the league – medal positions would be fantastic! The Male Masters (included above) and Senior Ladies team are currently at a brilliant 2nd in the league (well done to Bronwen Jenkinson, Wendy Trimbel, Andrea Rowlands and Becki Law). Not too far away from 1st place! Very well done to all of those runners who made the trip to the North Wales XC championships at the weekend too – I am informed of some fantastic running through hailstone storms – full results to follow! Want to run at Oswestry? As before, please contact Becki Law (bex85@msn.com or 07922968636) to let her know, including whether or not you’d like to travel in the minibus (first stop 10.45am at Parc Menai, Bangor). As before, the more the merrier and apparently there’s nice cakes afterwards at the prize giving too! NOTE: Please let me know if you want to run. For an athlete to compete they must be eligible to compete for Wales (i.e. born in Wales, parents are Welsh, lived continuously in Wales for 2 years). Third race of the 2013/14 season is at Pensarn, nr Abergele this Sunday at 11am. The race is free to enter for all Eryri members, just turn up, and run! SMR, 26th January 2014, Llanberis. Meet in car park opposite Surf Lines in Llanberis (Padarn Lake lagoons car parking area) at 1030. Run will most likely take in some nice loops through Glyn Rhonwy quarries and around Cefn Du. Thanks to DWT for hosting. There is 1 space remaining so get in touch asap if interested. The club committee have agreed to submit an entry into the prestigious Welsh Castles Relay, this year taking place on the 7th and 8th June. The Relay is a 20 stage relay event travelling between Caernarfon and Cardiff Castle. There are open, ladies and veteran categories. So we need 20 runners for 20 stages. It would also be fantastic if we could put together a ladies team, after all we are a big enough club and should be able to do it. The stages involve hilly road and mountain sections. Anyone interested please get in touch with Arwel Lewis on 07772 671202 or arweleryri@googlemail.com or see the below details and website. Who to insure your fellrace with? The club committee have agreed that any Race Organiser who is organising a fellrace on behalf of the club may obtain a race permit/insurance from whichever organisation they deem fit. This removes the obligation decided several years ago that they must obtain it from Welsh Athletics/UK Athletics. This decision recognises the fact that the burden of responsibility for race organisation and safety lies primarily with the Organiser, and therefore responsibility for meeting the permit issuers’ rules and regulations also lies with them. The committee recommends that in order to reduce the risk of falling foul of litigation/disciplinary action Organisers should examine closely the rules and regulations pertaining to the permit they have received and ensure that their own race organisation meets them. There were a number of Eryri finishers in today’s 4 Villages HM from the village of Helsby. On a gently undulating course Dils Rowlands ran well to run 30 seconds than his recent time at Cardiff to finish in 269th in 1.30.33. Next home for Eryri was Tina McDonnell in 1.49.26 – again running some 30 seconds faster than Cardiff, with Sioned Rowlands running some 5 seconds slower than in Cardiff finishing in 1.53.57. Despite a broken gearbox, help from Colwyn Bay to get runners to the 2pm start, and a fantastic effort from Bronwen who joined the race by sprinting straight from a replacement minibus, the ladies managed to field a team. Brilliant running from Don Williams too (MV70)! Very well done to the team of 11 Eryri men who made it to brave the worsening quagmire at 2.45pm, it was definitely tough going by that point! First Eryri man was Rich Roberts in an amazing 2nd place, first Eryri woman was Andrea Rowlands in an amazing 5th. Full results to follow later but in the meantime, very very well done to EVERYONE, a great team effort! 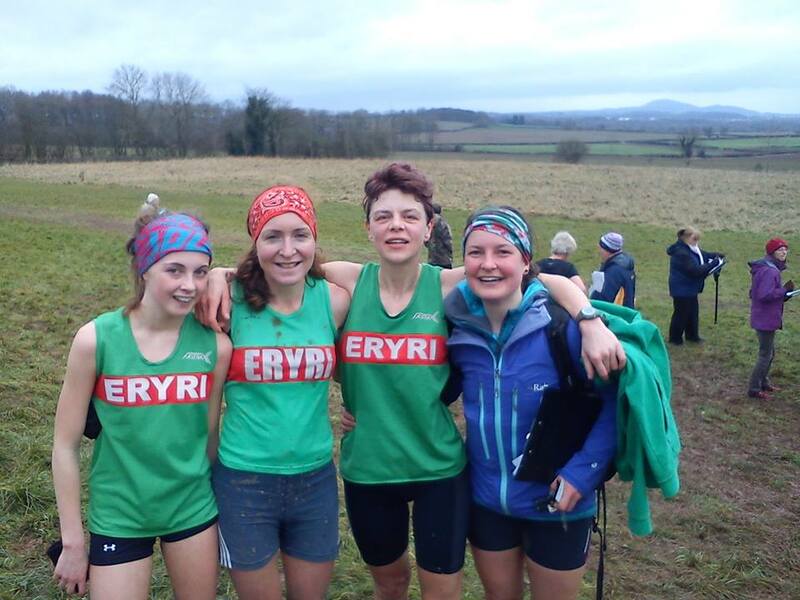 So good to see lots of Eryri vests, looking forward to the next one – 8th February in Oswestry. P.S. Anyone interested in even more mud – it’s the North Wales Championships in Northop on Saturday 25th January see the following link for information. And don’t forget the final race of the North Wales Cross Country League which takes place at Oswestry on Saturday 8th Feb. We need a big turnout to get us in the medal positions. Numbers continue to increase but at present I’m unsure whether we’re at 21 or 23, whichever, get in touch if you’re still interested as there is still space.